HDR (High Dynamic Range) offers the photographer unlimited possibilities when working with scenes that would be impossible for the camera to record in a single image. I liked this alley in Lucerne, Switzerland, with the repeating windows and bicycles that were parked along each doorway. The bicycles seemed to speak about how people get around in this area, and I felt it would make an interesting travel photograph. The dynamic range in this scene was too great for my camera to record in a single image. If I exposed for brightness in the alley, the rest of the image fell in darkness. If I exposed walls and windows, the alley detail was overexposed. Taking a series of different exposures allowed me to merge the images to HDR. This created a single well balanced photograph that shows all the wonderful detail in the highlight, mid-tone and shadow areas. Shooting for HDR is easy, the more challenging, but fun part is deciding how to portray the image. As a photographer, you are much the artist here and have sway over creating an image that is more illustrative/artistic, photo realistic, or somewhere in between. I used Photomatix to merge the images to HDR, and used the Photomatix Tone Mapping filter to define how I wanted the image to look. 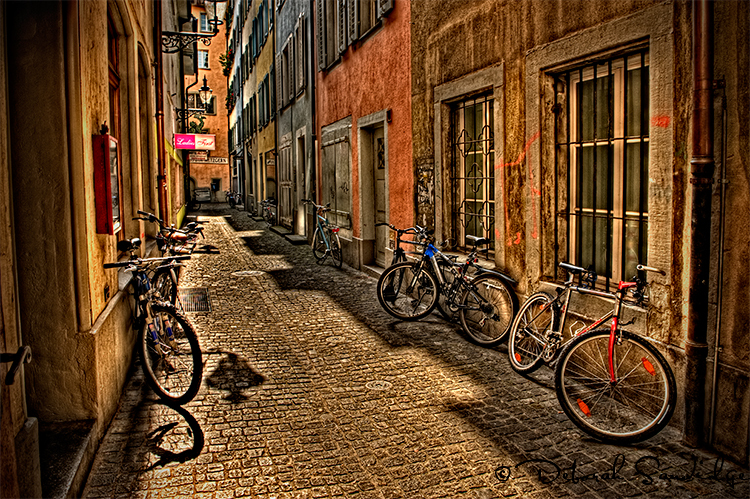 My goal was to emphasize the texture, color and detail on the interesting stucco walls, and cobblestone road and enhance the many colorful bicycles in the scene. In Photoshop, the image can be fine-tuned even more. Plug-ins and filters can give your HDR image the perfect finishing touch. I used a touch of Topaz Adjust Spicify, and added a slight vignette. Have fun shooting!